Chipmakers are enjoying their best ever start to a year, boosting investor confidence amid concerns of slowing economic growth. The VanEck Vectors Semiconductor ETF (SMH) — a fund that closely tracks companies in the sector — has gained nearly 22 percent since the start of the year, the best first-quarter performance since its inception in 2000. The recent rally in semiconductor stocks is a sharp reversal after the SMH tumbled during the final few months of 2018. Chipmakers are enjoying their best ever start to a year, boosting investor confidence amid lingering concerns of slowing economic growth. 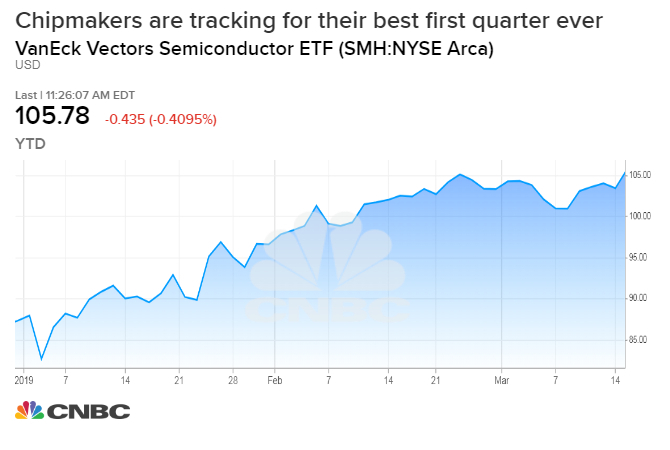 The VanEck Vectors Semiconductor ETF (SMH) — a fund that closely tracks companies in the sector — has gained nearly 22 percent since the start of the year, the best first-quarter performance since its inception in 2000. That surge outpaces the broader S&P 500's 12 percent rally. Chipmakers have now posted gains in 10 of 12 weeks to start 2019, and, on Friday, the ETF hit its highest level since early October. The recent rally in semiconductor stocks is a sharp reversal after the SMH tumbled during the final few months of 2018. Growing trade tensions between the U.S. and China, coupled with nagging concerns about China's economic growth, rattled confidence in some of the industry's key players. Soft iPhone sales, along with a deceleration in cryptocurrency mining ventures, further fed investor anxiety surrounding weakened demand. Taken in total, during 2018, the ETF saw its worst annual loss in a decade. But, amid investors' newfound optimism and more encouraging trends in the semiconductor industry, chip stocks have rallied more than 31 percent off of their recent low hit on Dec. 26. The Federal Reserve's move to pause interest rate hikes has bolstered high-flying growth names like Advanced Micro Devices and Micron. Both of these companies are among the best performers this year, with AMD up more than 27 percent and Micron up more than 23 percent. Rising rates tend to hurt these stocks as investors adjust to the new environment. The chipmakers' rally has come despite a mixed set of earnings reports over the past several weeks. On Friday, Broadcom jumped more than 8 percent after reporting better-than-expected results and issued encouraging guidance for the rest of 2019. But its peers have not been as successful in assuaging investors' concerns. In late January, Nvidia reported its first quarterly year-over-year revenue decline in five years, while Intel lowered its outlook for the year, citing ongoing trade concerns. Qorvo, meanwhile, issued guidance well below Wall Street expectations in its report in early February. But that hasn't stopped investors from jumping in, as many point to improving signs about the U.S. and global economy. "These days the semiconductor companies have their tentacles in everything," CNBC's Jim Cramer, host of "Mad Money", said last week. "Now, I often tell you that housing punches above its weight when we talk about the economy. If housing's strong, then the strength might spread to banks and retail. These days, in the new global economy dominated by data, the semiconductor stocks punch well above their weight, just like housing." Nvidia's $6.8 billion bid to buy Israeli chipmaker Mellanox has also helped renew investors' faith in this beaten-down sector. Nvidia beat out several other potential suitors, including rival Intel, and some see the move as evidence that these companies are more aggressively pursuing new growth channels. The deal, if approved, would mark Nvidia's biggest ever acquisition as it pushes into the growing data center market. The stock has now surged more than 27 percent to start the year, but it still down 42 percent from its most recent peak in early October. Some investors see more tail winds ahead for these semiconductor stocks, and the tech sector more broadly — citing recent data showing that consumers, in the U.S. in particular, remain on solid footing. Job vacancies jumped to a fresh high of 7.6 million in January, topping expectations, according to a Bureau of Labor Statistics report released Friday. The Job Openings and Labor Turnover Survey, which measures the level of employment vacancies as well as how many workers left their jobs and the reasons for the separations, has been indicating a continued swell of employment opportunities. "It would be a fool's errand to bet against a fully employed U.S. consumer," Jim Lowell, CIO of Adviser Investments, told CNBC. "Today's job openings report is clearly indicative of a consumer that is very confident in near-term economic conditions, so confident that they are leaving their existing jobs to find a more interesting or better-paying job in droves. We take that as a very bullish indicator on the strength of our economy and ... the global economy as well." Still, other analysts caution that the price momentum for semiconductor stocks could falter if the ultimate terms of a U.S.-China trade deal disappoint. These companies are seeking specific measures to better protect intellectual property, especially in gaming and artificial intelligence. Chipmakers are also looking for concrete steps to boost merger activity following two blocked deals last year. American regulators rejected Broadcom's bid to buy Qualcomm, while Chinese regulators nixed Qualcomm's bid to buy NXP Semiconductors. Semiconductor stocks currently sit less than 6 percent away from their all-time high set in March 2018. — CNBC's Gina Francolla contributed to this report.